ESSA’s Watershed Report Cards provide existing information on fish species distribution and habitat use, and the perceived risk to those fish habitats, in a clear, visually-based synthesis that provide watershed agencies with a powerful and easily understood tool to help inform land management decisions. Watershed Habitat Status Report Cards represent comprehensive summaries of the extent and intensity of broad development pressures affecting fish habitats and, in some cases, the condition of key habitat processes within the watershed. 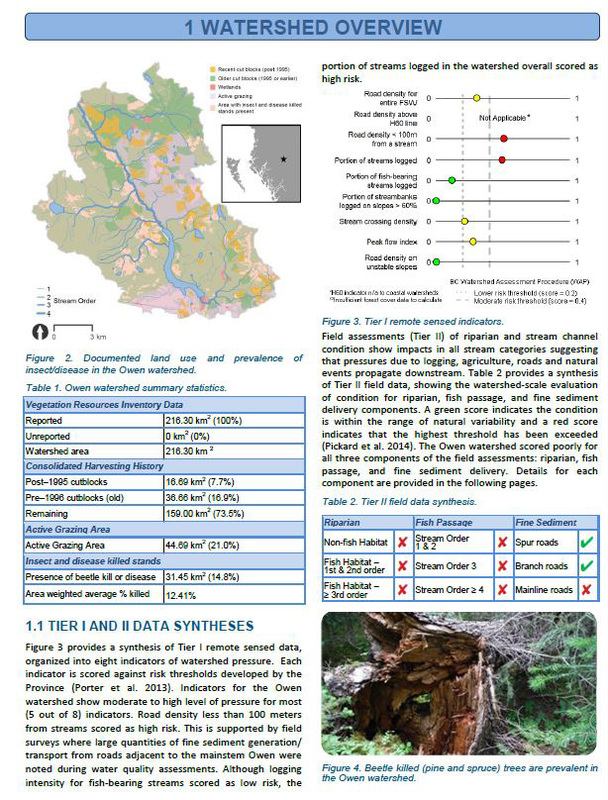 ESSA’s Watershed Report Card approach and analytical methodologies have been use to support watershed assessment exercises undertaken by Fisheries and Oceans Canada for southern Chinook Conservation Units, the Cohen Commission for Fraser River sockeye Conservation Units , the BC Ministry of Environment and Ministry of Forest Lands and Natural Resource Operations for watersheds on Vancouver Island and in northeastern BC, the Bulkley Valley Research Centre for the Owen and Lamprey Rivers, and the Pacific Salmon Foundation for watersheds used by salmon species across the Skeena and Nass River basins. ESSA develops their Watershed Status Report cards using transferable protocols they have developed that utilize the best available GIS layers and habitat datasets that can be obtained for individual watersheds or across larger drainages from provincial and federal agencies, as well as those obtained from First Nations and local stakeholders through collaborative workshops organized for regional data sharing. Additional focused field data collection may be designed and implemented by ESSA and partners to provide better information on the status of habitat processes in key watersheds. The data collected is synthesized and summarized using analytical approaches and standardized templates for map-and-graphically-based presentations that ESSA has developed for providing decision makers with clear information on watershed stressors and habitat condition in highly visual, easily interpretable formats. 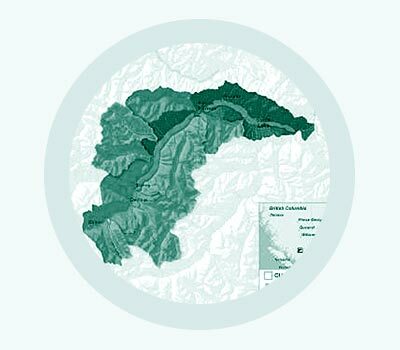 ESSA continues to refine and expand their Habitat Report Card methodologies and have recently applied the approach in collaboration with the Pacific Salmon Foundation to assess the status of salmon habitats in the Skeena River estuary and the extent/intensity of ongoing development pressures.